We have available a litter of F1 miniature Labradoodle puppies. boys and girls are available .4 boys . 6 girls.. Mum is Bullit a small pedigree KC registered silver Labrador and is DNA health tested clear. Dad is Dennis a pedigree KC registered chocolate miniature poodle who is DNA health tested clear for DM. MH. MTC. FN. PRA.PRDC and vWD 1. Health test paperwork is available for inspection at puppy viewing as are both parents pedigrees. Both parents have fantastic temperaments. The puppies will be wormed every two weeks from 2 weeks of age and will come with a preventative flea treatment. Puppies will be micro chipped and available for collection from 9 weeks of age .6th August. after being fully vaccinated with both first and second injections .using Versican DHPPi plus L4. so you will be able to walk and take your puppy out to meet your friends straight away without any risk of infection. All copies of DNA certificates. explanation sheet for all the DNA tests. vaccination record. a copy of the veterinary health report and a copy of ..Raising Your Puppy.. information and advice booklet will be supplied with each puppy along with their favourite teddy smelling of their brothers and sisters and a blanket smelling of mum. 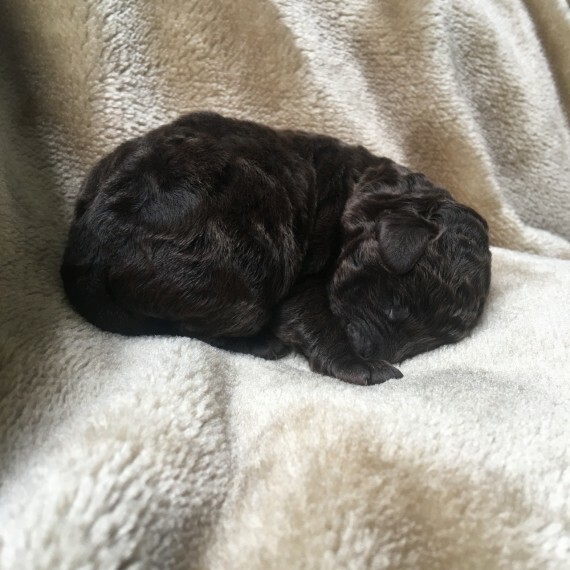 The litter consists of silver.chocolate coloured puppies and can be reserved with a non refundable deposit of 400 deposit on the basis of first deposit received will secure first pick of the litter. 2nd deposit second pick etc and they will be available to view once they have been micro chipped.